Natchitoches, (Nack-a-tish) the original French colony in Louisiana, is the oldest settlement in the Louisiana Purchase. Established in 1714, Natchitoches (Nack-a-tish) retains its European flavor through its architecture, heritage and lifestyle. 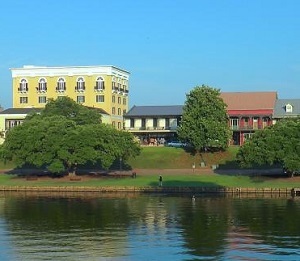 Natchitoches is the Bed & Breakfast Capital of Louisiana. The area is also known for the filming of Steel Magnolias as well as year-round festivals including the annual December Festival of Lights. it's festive, it's historic, it's cultural, it's Natchitoches, Louisiana. The Natchitoches area, is home to three state historic sites, Creole plantations, and museums all within the boundaries of the Cane River National Heritage Area. At the heart of Natchitoches lies the National Landmark Historic District that is full of local boutiques and gift shops, fabulous dining options and plenty of bed & breakfasts. Northwestern State University has a renown creative and performing arts department, which puts on the Natchitoches-Northwestern symphony twice a year. They also do at least two theater or musical shows per college semester. The choirs and orchestras have frequent performances, and international artists are known to visit and perform at the school. Hertz and Enterprise rental cars available. The hospital is the Natchitoches Regional Medical Center. On Northwestern State University's campus, there is a Wellness and Recreation complex. Jan 35.9 F° 46.3 F° 56.7 F° 5.7 "
Feb 39.0 F° 50.5 F° 62.0 F° 4.4 "
Mar 46.3 F° 58.0 F° 69.7 F° 5.3 "
Apr 53.0 F° 64.9 F° 76.8 F° 4.5 "
May 62.4 F° 73.2 F° 84.0 F° 5.8 "
Jun 69.9 F° 80.0 F° 90.2 F° 4.5 "
Jul 73.5 F° 83.4 F° 93.3 F° 3.4 "
Aug 72.5 F° 82.8 F° 93.1 F° 3.5 "
Sep 66.4 F° 77.1 F° 87.8 F° 3.1 "
Oct 54.4 F° 66.5 F° 78.6 F° 4.1 "
Nov 45.2 F° 56.4 F° 67.6 F° 4.6 "
Dec 38.0 F° 48.6 F° 59.2 F° 5.9 "
We have a long growing season. Typically the temperatures are very warm all year round. The hottest the weather will be in August, with the heat index reaching up in the low hundreds. The coldest weather will be in January, with temperatures in the low thirties.